Three countries, two coffee stops and one ferry. Firstly let’s celebrate a warm evening in Bregenz enjoying the rather surreal ending of the Bregenz jazz festival. After the headliners (including Flook) had departed, there was a junior talent show, with pre-teens Front Page picking up the honours for their note-perfect My Sharona. Monday dawned bright and sunny and we quickly left Austria for Germany. Coffee in Friedrichshafen, opposite the Zeppelin museum as it was starting to get hot. More elegant resort towns along the banks of Bodensee, then a real live Zeppelin hovering over the mediaeval centre of Unterstadt. 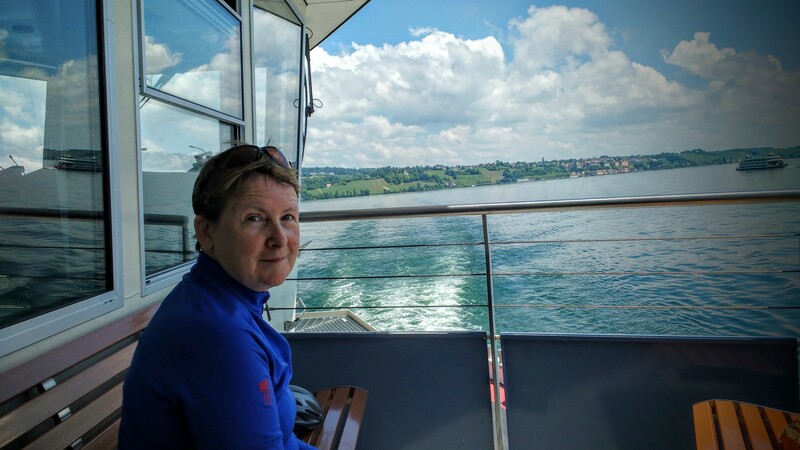 With good timing, we rode straight on to the ferry at Meersburg and enjoyed a pleasant 15 minutes crossing the breadth of the lake. Second coffee stop at a bakery in Konstanz, where C used her best Duolingo German to charm the bakery lady. She is also basking in the glow of her profound tweet “yesterday’s snow melt is tomorrow’s river” going viral. 7 likes and 5 retweets and climbing! Speaking of climbing, back in Switzerland, a tiny boy on a tiny bike staged an attack on a short, steep climb in Mammern, but C simply snorted “See you in Rotterdam, sonny”.